My former colleagues at OECD have just produced an excellent report which should disturb, and which deserves really wide discussion – especially as I agree wholeheartedly with one of their major, and radical, recommendations. This is based on PIAAC evidence – an international survey based on direct testing of people’s competences (Hence the aspirin bottle and petrol gauge – real-life tasks sued for the tests). These are graduates in the standard English sense – people with degree qualifications. Makes you think, whether or not you’re a Daily Mail reader. 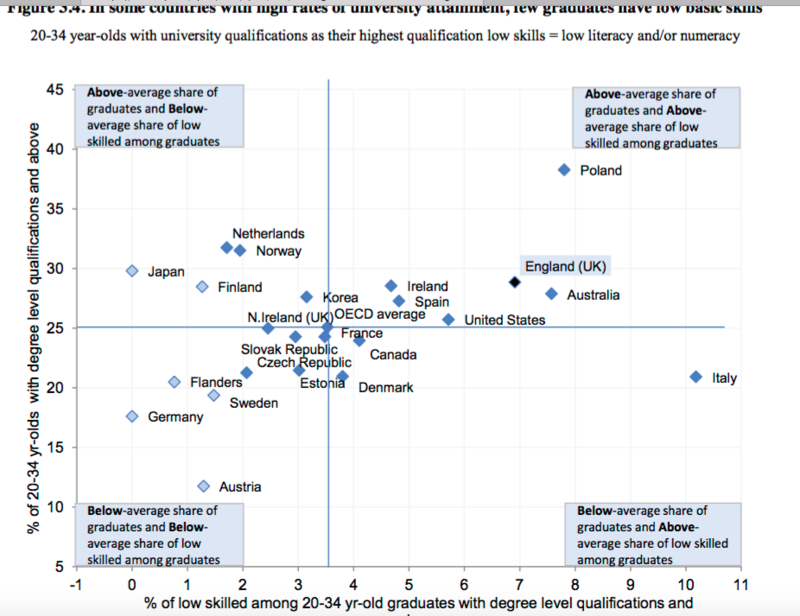 England is in the top right quadrant: high proportions of graduates, but unusually high proportions of them with low skills. Not where you want to be. Some of us have been arguing for some time for such redeployment, though not on the basis of the evidence that the OECD have now been able to adduce. Alison Wolf is one who has powerfully pointed out the almost grotesque imbalance in the way the FE sector is treated compared to HE. I know that my former university colleagues (yes, I’ve been around, so have quite a variety of former colleagues) will rush to say that the two should not be pitted against each other. I accept that there is no necessary zero sum gain; but the imbalance stands to be corrected. Why should HE students be funded at twice the rate of their FE equivalents? FE caters for a poorer student population, who generally have less in the way of family support as well as qualifications and money. There’s a further wrinkle. HE students now take out big loans, paying £9K fees to universities, who are now cash-rich. Mostly, university graduates will go on to earn higher incomes, and pay back the loans. That’s the theory, and some of the public money lent out will come back (though not nearly as much as the government originally said). But it’s much less likely to come back from graduates with low skills. So the public purse is particularly being used to support the graduates with low skills. I’m all in favour, – very much so – of supporting people with low skills; but the finance for this does not need to go on high fees for university study. It seems to me unarguable that many of these would be far better off in a college – especially if that college were more adequately funded to give them the support they need. In other words, our training effort is declining; and a significant chunk of this goes on activities which may be important (as safety is) but which don’t do much to address the issue of low skills.